This is a story about kale. No, wait. This is a story about being busy with a long to do list and still wanting to eat something homemade. And as usual, there was an abundance of kale waiting to be turned into something delicious. 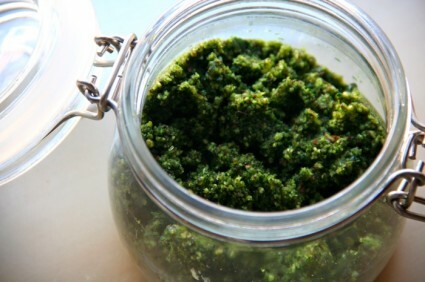 I can’t emphasize the simplicity of this pesto enough. Let me put it this way: in the midst of moving, and the kitchen in a state of complete and utter disaster, I still made it. This could speak to my level of culinary insanity, but I like to think that it just says that this recipe is really good if you’re pressed for time. Green, healthy, good. What more could you want? 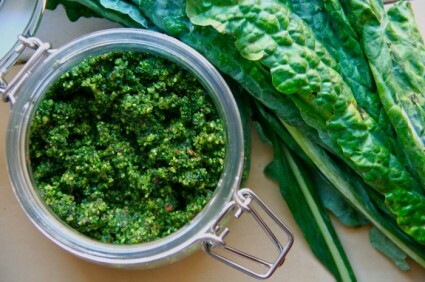 Place hazelnuts, kale, garlic, salt, pepper and 2 tablespoons of olive oil in a food processor. Churn until you get a spreadable consistency. At this point, you may want to add a little extra olive oil to make the pest just a bit creamier and hold together better. Taste, and add more salt and pepper if needed. You can use this as a spread, a dip or on pasta. Or just eat it by the spoonful if you are having a severe kale craving. They happen. Eat Healthy Food or Take a Pill? I would make this with toasted Mediterranean pine nuts and skip the salt and oil. Maybe add some fresh basil. Yum, that would definitely be good! Toast 5-7 mins the hazelnuts first to release flavor. Let cool before adding to pesto mix in processor.